The Uni has been replaced by the Porter 5 and Porter 10 controllers. Uni speed controller. Two current ratings are available, the Uni-8 with a current limit of over 100 amps and the Uni-4 with current limit of over 50 amps. As standard, it includes regenerative braking but this can be disabled on board, or it can be supplied without, subject to a minimum order quantity. Versions are available for 12v and 24v. 36v and 48v versions are possible subject to minimum order quantities.. It is available as a card or as a boxed unit (order controller plus base, cover and leads). The Uni is technically advanced and packed with useful features without the ‘high tech overkill’ which is often used as a sales gimmick. The controllers have been extensively ‘value engineered’ to give the best possible ratio of performance to cost. Of special interest is the automatic ramp down and power off so the controller always stops smoothly and safely even if the ignition is turned off at full speed. Also if interest are the independent, linear, adjustable acceleration and deceleration ramps, the thermally sensitive overcurrent limiting, the regen current limit and the auto switch-off. Supply voltage 12v or 24v 36v or 48v – depends on model. Output voltage 0 to 100% full speed, adjustable. 1 minute rating 85 amps – board, without additional heatsink! 2 minute rating 45 amps – board, without additional heatsink! Electronic Ignition on pot, with auto switchoff at pot zero. Reverse polarity protection is integral. Battery discharge protection is not fitted. 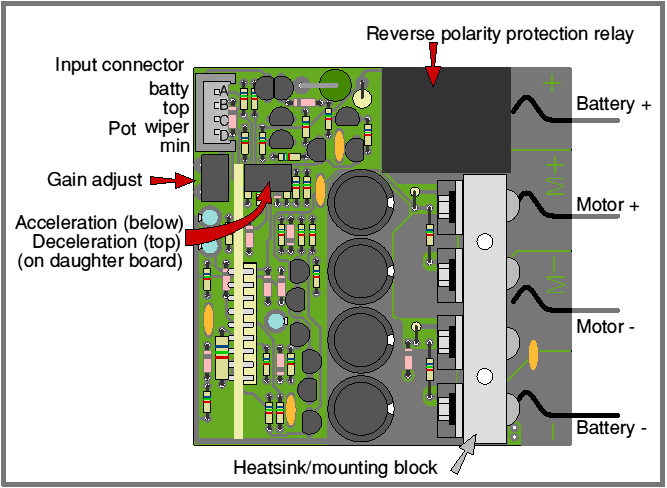 Pot overvoltage feature enables pot fault protection to be enabled in the pot circuit. See manual. 48v version occasionally available. See 48v controllers page. 4 pin control connector (supplied) accepts standard miniature stranded cable (7/0.2). Only 3 wires are normally used: fourth pin allows options in external wiring. Carefully engineered thermal design maximises output current. Power and motor connections are by 6.3mm tabs. May be used with PM, shunt or series wound motors. 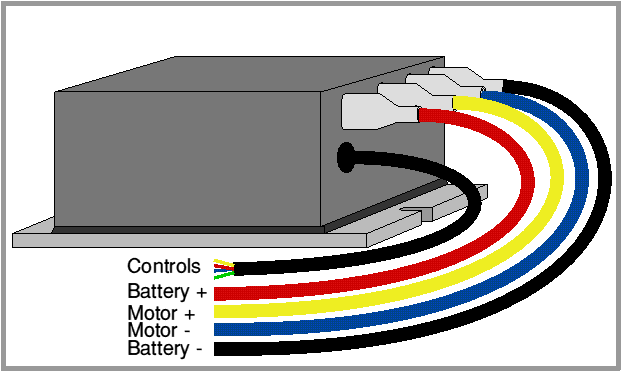 The diagram above show the arrangement of the enclosed controller with heatsink/base (order controller plus base, cover and leads) and 100cm control lead and 50cm power leads. A plan view of the uncased controller (board version). Showing how the board controller mounts onto the base.